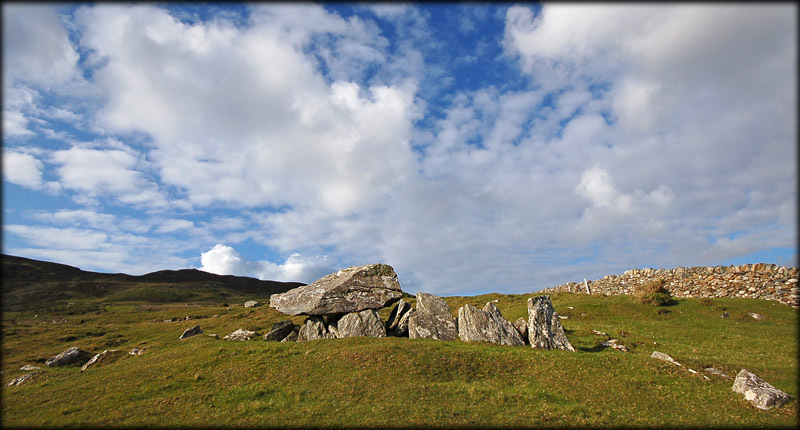 On my recent trip to the west coast of Ireland, I was so delighted to have visited this quite compact court tomb. All that remains of the tomb is a three chambered gallery, above the middle chamber sits a wonderful large capstone. The tomb is aligned north/west-south/east and the missing court would have stood at the south/east. The site is beautifully situated on the north side of Cleggan Bay. 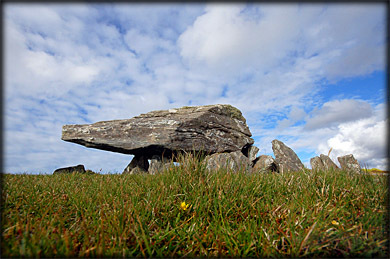 Inishbofin is almost in alignment northwest of the tomb. This would be a delightful place for a picnic, our ancestors certainly picked some wonderful locations to build their monuments, the location of this site is certainly amongst the very best. Situated: From Clifden take the N59 north. Then turn left onto the R379. After 4k take a right turn by Cleggan strand, then first left up a track to holiday homes. park in the area for visitors. Walk straight along the track through four gateways, turn sharp left and walk south. Ask for permission at the house near the first gateway. Discovery Map 37: L 6065 5892. Last visit May 2009.